Extract from Amnesty International’s last report on Mining and Human Rights in Katanga. The Democratic Republic of the Congo has some of the world’s most important mineral reserves. For more than a decade the extraction of these resources has been linked to conflict, human rights abuses and corruption. In the southern province of Katanga, people’s lives have been torn apart as a result of mining operations. Small-scale miners working in appalling conditions have suffered arbitrary detention, beatings, ill-treatment or even death at the hands of the police or the mines’ security personnel. Communities have been forcibly evicted from mining areas. 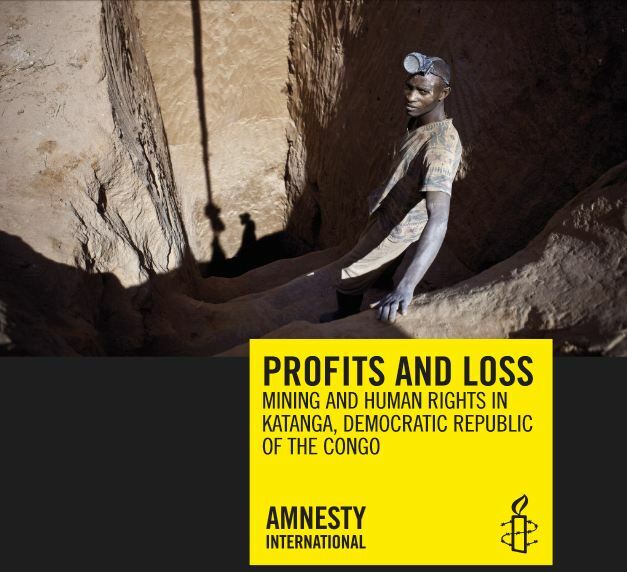 This report highlights significant human rights abuses in Katanga’s mining sector. The DRC has ratified most of the core international human rights treaties, including the International Covenant on Civil and Political Rights, the International Covenant on Economic, Social and Cultural Rights, the International Convention on Elimination of All Forms of Racial Discrimination, the Convention on the Elimination of All Forms of Discrimination against Women, the Convention on the Rights of the Child and the Convention against Torture and other Cruel, Inhuman or Degrading Treatment or Punishment. At a regional level the DRC has ratified the African Charter on Human and Peoples’ Rights, and the African Charter on the Rights and Welfare of the Child. Under international law, States have a duty to protect human rights from abuse by non-State actors, such as companies. Over the past decade there has also been increasing recognition of the responsibility of companies to respect human rights, particularly as elaborated in the UN “Protect, Respect and Remedy” Framework for Business and Human Rights and the UN Guiding Principles on Business and Human Rights.41 Over and above the business responsibility to respect, companies must ensure that they do not commit or materially assist with the commission of illegal or criminal acts that lead to human rights abuses abroad. Additionally, in 2011 independent human rights legal experts articulated the Maastricht Principles on Extraterritorial Obligations of States in the area of Economic, Social and Cultural Rights.45 These Principles – drawn from international law – elaborate, amongst other issues, the responsibility of States with respect to companies based in their jurisdiction but operating internationally. The UN “Protect, Respect and Remedy” Framework for Business and Human Rights and the UN Guiding Principles on Business and Human Rights (Guiding Principles) confirm that companies have a sponsibility to respect all human rights, and a corresponding need to take concrete action to discharge this responsibility. Addressing adverse human rights impacts requires taking adequate measures for their prevention, mitigation and, where appropriate, remediation.